Kryptonian Warrior: Don't Starve Review and Multiplayer announced! For those of you who aren't intimately familar with that dread as night begins to fall while you search frantically for a single piece of flint so you can cut down trees and make a fire, for those who have never experienced being chased through a forest by three different swarms of hissing spiders intent on your doom, for those who are yet to know how it feels to watch the flames creep higher and further afield, burning and destroying your base camp, the expensive equipment in it, your food stash and almost every single tree you could possibly reach in the space of a day, even your best and only friend Chester, who loyally carried all your junk for you, is happily bouncing along beside you no more...Welcome to Don't Starve, a game where you fight tooth and nail (sometimes even beards are involved!) to simply survive another day. Don't Starve is "an uncompromising wilderness survival game full of science and magic"
Klei promised that Don't Stave would be the best single player game they could make and for me personally this is very true. There's no tutorial of any sorts to go through, the game gives you no real instruction at all and there's something about just being left to your own devices that just makes this game more fun, it doesn't baby you through even your first few nights and it feels like even more of an accomplishment when you see the sun rise in the morning and know you've survived another night in this cruel world. About five minutes later I was savagely killed by wolves. Instead of feeling angry though I just felt more determined to survive for longer, to explore, see and create more things than the previous try, even unlocking new characters with the experience you gain from each previous play through who all have different upsides and downsides. 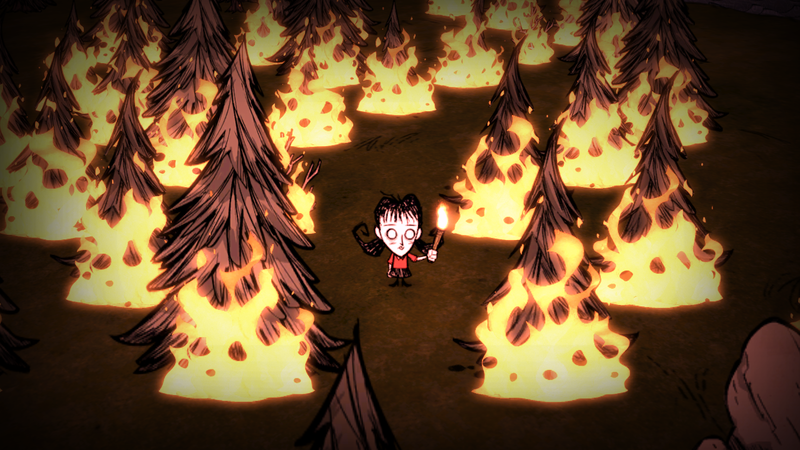 Although Willow is possibly my favorite character, I always end up starting mass fires! With it's quirky art style and no nonsense attitude Don't Starve has had a decent fan base ever since it's early access beta release on Steam and it has only grown, with loads of updates and new features such as caves, new items, new powers and new mobs, all included free with the original game purchase. Klei even released the games first paid DLC "Reign of Giants" which came out of Beta and was officially released at the end of April this year which is another new challenge great for experienced players with two new biomes (desert and Deciduous forest), two new seasons (spring and autumn), new ways to die (overheating and the freezing to death before winter even arrives thanks to the new wetness meter and then even if you survive the rainy spring summer is now even more deadly!) as well as new mobs and critters! Now Klei have announced another exciting new feature that will be a free addition called "Don't Starve Together" that's right folks...Multiplayer is coming! As mentioned it will be a free update like the others but the game itself will be going up in price a smidgen around the time this update will be in alpha, which is more than understandable with the amount of awesome content they've been squeezing in and how far it's come since that early access bet! So I suggest that if you're planning on buying I'd do it now before the price increase. So yes! I mentioned multiplayer! A developer posted on the Klei forums about the topic (which you can go and read here) telling us they're hoping to have it out or at least in beta by late summer, it will allow (at minimum) 2-4 players to play together publicly or privately and will feature most (if not all) of the current features and potentially some new ones too! The Don't Starve website itself also posted a little mini comic strip yesterday as way of announcing the update to readers of the newsletter and the site itself which I will leave with you while you ponder if you could grow as magnificent a beard as our Wilson here.